What Was Kim Yo-jong Thinking as She Returned to North Korea from the Olympics? World View: What Was Kim Yo-jong Thinking as She Returned to North Korea from the Olympics? History has been made this weekend, as the visit by North Korean officials to the Winter Olympics in Seoul has produced a softening of tensions between North and South Korea, and is succeeding in driving a wedge between South Korea and its allies, the United States and Japan. North Korea’s child dictator Kim Jong-un is truly brilliant at marketing. And best of all was Kim Yo-jong, the dictator’s sister. She not only charmed president Moon Jae-in, she also charmed all of South Korea and in fact the whole world. That is what you would believe if you read the mainstream media coverage of the Seoul Olympics. U.S. Vice President Mike Pence was described as “the loneliest figure” in the audience. 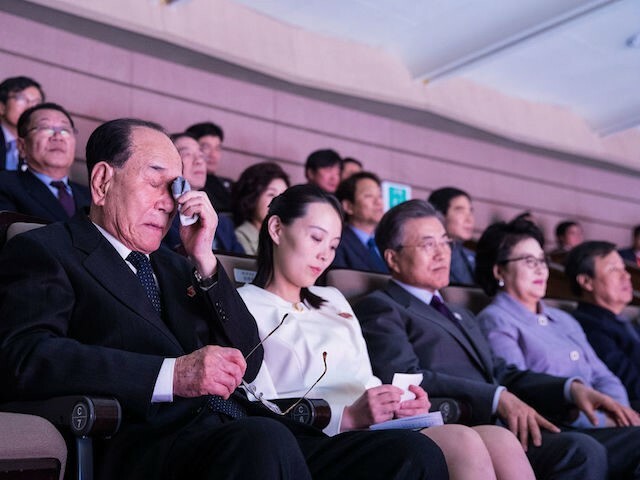 He is described as having “snubbed” Kim Yo-jong, seated just a few feet away from him. Pence was truly the Grinch Who Stole Christmas. The US will not allow the propaganda charade by the North Korean regime to go unchallenged on the world state. the world can NOT turn a blind eye to the oppression & threats of the Kim regime. Honestly, I never thought I would visit (the South) so suddenly and believed much would be strange and different but I saw many things that were similar or the same. Here’s to hoping that we could see the pleasant people (of the South) again in Pyeongchang and bring closer the future where we are one again. I thought that this was a very interesting statement, because it reminded me of the surprising outcome of a visit by Russia’s Boris Yeltsin to the United States in 1989. Yeltsin was visiting the Johnson Space Center in Houston on September 16, 1989, when suddenly he asked to go shopping at a grocery store to be chosen more or less at random. 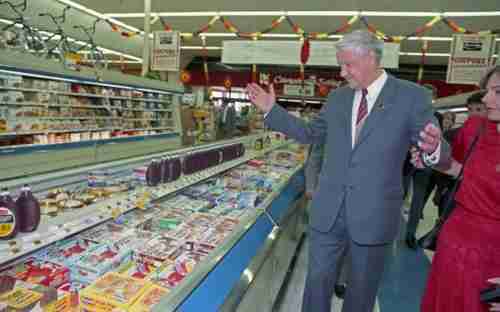 He ended up at Randall’s Supermarket in Clear Lake and was astounded at the bewildering variety of products available to American shoppers. He had been led to believe that the grocery stores in America were even worse than the ones in Soviet Russia, and he was shocked to learn the truth. So, when Kim Yo-jong says that she “saw many things that were similar or the same,” what was she thinking? Was she reflecting on the many things that were dissimilar, and how much better off the South Korean people are than the North Korean people? It is an interesting speculation, but Kim Jong-un is no Yeltsen. Nothing short of war is going to stop North Korea from developing its arsenal of nuclear-tipped ballistic missiles. Still, there are many questions: What is Kim Yo-jong thinking? Will she try to convince her brother to end his nuclear weapons program? And if she does try, will he have her killed, the way he has had other family members killed? Inquiring minds want to know. Kim Yo-jong is pretty, and Moon Jae-in is charming, and they make a very attractive couple, and the media have been fawning over them, but the core issues have not changed. Kim Jong-un has already said that he can reach the United States with a nuclear weapon and that he is safe from attack, though that is believed to be an exaggeration. It is believed that the purpose of his Olympics charm offensive was to buy at least two months’ time to continue development. And now by inviting Moon to visit him, he hopes to buy some more time. 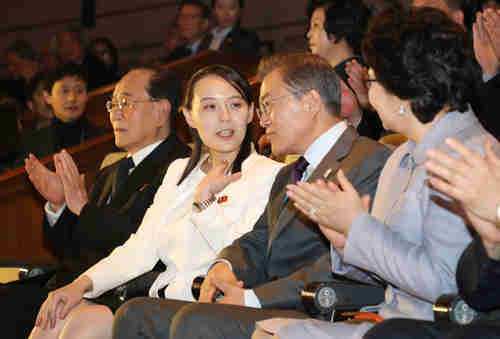 Moon’s presidential campaign was about closer relations with the North. Moon would like to accept the North’s invitation to visit, but should he set preconditions? Should Moon demand as a precondition that a denuclearization discussion should be on the agenda for his visit North? Kim Jong-un has refused to discuss the nuclear issue with him in the past, and this demand may cause the North to walk away. Should Moon demand that the North be willing to discuss denuclearization with the Americans? Kim has refused to talk to the Americans. Should the annual joint U.S.-South Korea military drills, which were postponed until the Olympics games were over, take place immediately after the end of the Olympics? What should Moon recommend with regard to economic sanctions on the North — reduce them, increase them, or leave them the same? Should Moon and the US agree to go ahead with a “bloody nose” attack on North Korean nuclear and ballistic missile facilities? The politics behind the “bloody nose” attack are very interesting. I have heard one analyst after another say that such an attack is “clearly and obviously impossible,” because the North would immediately retaliate with a massive artillery attack on Seoul. But, actually, that does not make sense, as the logic points in the opposite direction. Assuming that a way can be found to destroy North Korea’s nuclear and ballistic missile development facilities, the North would just have to accept it. If the North retaliated and attacked Seoul, then the next American attack would completely destroy Kim Jong-un’s government, and Kim himself would be killed. American government officials have been extremely clear that they will not permit North Korea to “have a deliverable atomic weapon that can reach the United States reliably. It just cannot be,” in the words of John Kelly, echoing statements by Donald Trump, H.R. McMaster, Steve Bannon, Lindsey Graham, and others. These are all considerations that Moon will have to take into account, as he decides what his next steps will be. If an inter-Korean summit is realized, it will be recorded as the biggest achievement of the PyeongChang Olympics. We have to work with greater responsibility as we make preparations and respond carefully to the invitation. Although there may be disagreements and concerns at home and abroad, what’s clear is that peace stems from dialogue and it’s impossible to oppose dialogue if we want peace. We once again warn that a visit by the president to North Korea, unless it is premised on denuclearization, would be nothing more than a congratulatory delegation celebrating (the North’s) nuclear development and would amount to an enemy-benefiting act.